Members of Local 2003 at Ft. Rucker, AL, cast ballots during ratification voting for a new three-year agreement with Army Fleet Support. Nearly 3,800 members of Local 2003 at Ft. Rucker, AL, voted recently to ratify a new three-year agreement with Army Fleet Support. The pact includes annual raises of three percent and a 50 cent-increase in the employer’s contribution to the IAM Pension Plan over the term of the contract. The sprawling base in southeast Alabama is the Army’s largest helicopter base. Operational units on the post include the 1st Aviation Brigade and the 110th Aviation Brigade handling Army Aviation training, and the USAF 23rd Flying Training Squadron for the training of Air Force helicopter pilots. IAM mechanics service and maintain the helicopters, and IAM test pilots fly at Ft. Rucker. 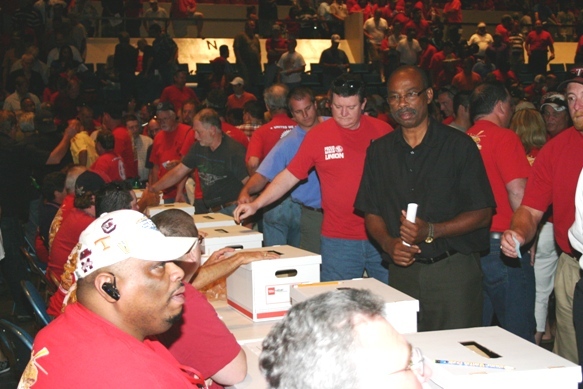 Members of Local 2003 ratified their contract while collecting food and funds for victims of the recent tornados that swept across Tuscaloosa and Northern Alabama. In 2007, a deadly tornado slammed into nearby Enterprise, AL, causing nine deaths and injuring over 121 others. The worst damage occurred at Enterprise High School, where eight students died after a hallway roof collapsed.